Desvenlafaxine, sold under the brand name Pristiq among others, is a medication used to treat major depressive disorder. Evidence supports a benefit up to eight weeks. It appears less effective than its parent compound venlafaxine. It is taken by mouth. Common side effects include dizziness, trouble sleeping, increased sweating, constipation, sleepiness, anxiety, and sexual problems. Serious side effects may include suicide in those under the age of 25, serotonin syndrome, bleeding, mania, and high blood pressure. A withdrawal syndrome may occur if the dose is rapidly decreased. It is unclear if use during pregnancy or breastfeeding is safe. It is an antidepressant of the serotonin-norepinephrine reuptake inhibitor (SNRI) class. Desvenlafaxine was approved for medical use in the United States in 2008. Use in Europe was declined in 2009. In the United States the wholesale cost is about 25.20 USD per month. In 2016, it was the 272nd most prescribed medication in the United States, with more than a million prescriptions. Desvenlafaxine is primarily used as a treatment for major depressive disorder. Use has only been studied up to 8 weeks. It, however, appears less effective than venlafaxine. Doses of 50-400 mg/day appear effective for major depressive disorder, although no additional benefit was demonstrated at doses greater than 50 mg/day, and adverse events and discontinuations were more frequent at higher doses. Desvenlafaxine improves the HAM-D17 score and measures of well being such as the Sheehan Disability Scale (SDS) and 5-item World Health Organization Well-Being Index (WHO-5). 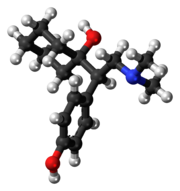 Desvenlafaxine is a synthetic form of the isolated major active metabolite of venlafaxine, and is categorized as a serotonin-norepinephrine reuptake inhibitor (SNRI). When most normal metabolizers take venlafaxine, approximately 70% of the dose is metabolized into desvenlafaxine, so the effects of the two drugs are expected to be very similar. It works by blocking the "reuptake" transporters for key neurotransmitters affecting mood, thereby leaving more active neurotransmitters in the synapse. The neurotransmitters affected are serotonin (5-hydroxytryptamine) and norepinephrine (noradrenaline). It is approximately 10 times more potent at inhibiting serotonin uptake than norepinephrine uptake. Approval of desvenlafaxine's proprietary name, Pristiq. The FDA approved the drug for antidepressant use in February 2008, and was to be available in US pharmacies in May 2008. In March 2017, the generic form of the drug was made available in the US. 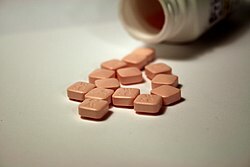 On February 4, 2009, Health Canada approved use of desvenlafaxine for treatment of depression. In 2009, an application to market desvenlafaxine for major depressive disorder in the European Union was declined. In 2012, Pfizer received authorization in Spain to market desvenlafaxine for the disorder but it is not being sold. Desvenlafaxine is classified as a schedule 4 (prescription only) drug in Australia. It was listed on the PBS (Pharmaceutical Benefits Scheme) in 2008 for the treatment of major depressive disorders. ^ a b c d e f g h i "Desvenlafaxine Succinate Monograph for Professionals". Drugs.com. American Society of Health-System Pharmacists. Retrieved 18 March 2019. ^ a b c d "Withdrawal Assessment Report for Dessvenlafaxime" (PDF). EMA. p. 3. Retrieved 22 March 2019. ^ "Desvenlafaxine Pregnancy and Breastfeeding Warnings". Drugs.com. Retrieved 19 March 2019. ^ a b "PRODUCT INFORMATION PRISTIQ® desvenlafaxine (as succinate)" (PDF). TGA eBusiness Services. Pfizer Australia Pty Ltd. 10 December 2012. Retrieved 8 November 2013. ^ Perry, Richard; Cassagnol, Manouchkathe (2009). "Desvenlafaxine: a new serotonin-norepinephrine reuptake inhibitor for the treatment of adults with major depressive disorder". Clinical Therapeutics. 31 Pt 1: 1374–1404. doi:10.1016/j.clinthera.2009.07.012. ISSN 1879-114X. PMID 19698900. ^ Thase ME, Kornstein SG, Germain JM, Jiang Q, Guico-Pabia C, Ninan PT (March 2009). "An integrated analysis of the efficacy of desvenlafaxine compared with placebo in patients with major depressive disorder". CNS Spectr. 14 (3): 144–54. PMID 19407711. ^ Soares CN, Kornstein SG, Thase ME, Jiang Q, Guico-Pabia CJ (October 2009). "Assessing the efficacy of desvenlafaxine for improving functioning and well-being outcome measures in patients with major depressive disorder: a pooled analysis of 9 double-blind, placebo-controlled, 8-week clinical trials". J Clin Psychiatry. 70 (10): 1365–71. doi:10.4088/JCP.09m05133blu. PMID 19906341. ^ "DESVENLAFAXINE tablet, extended release [Ranbaxy Pharmaceuticals Inc.]". DailyMed. Ranbaxy Pharmaceuticals Inc. March 2013. Retrieved 9 November 2013. ^ "desvenlafaxine (Rx) - Pristiq, Khedezla". Medscape Reference. WebMD. Retrieved 9 November 2013. ^ Lemke, Thomas L.; Williams, David A. (2012). Foye's Principles of Medicinal Chemistry. Lippincott Williams & Wilkins. p. 609. ISBN 978-1-60913-345-0. ^ a b Deecher, DC; Beyer, CE; Johnston, G; Bray, J; Shah, S; Abou-Gharbia, M; Andree, TH (August 2006). "Desvenlafaxine succinate: A new serotonin and norepinephrine reuptake inhibitor" (PDF). The Journal of Pharmacology and Experimental Therapeutics. 318 (2): 657–665. doi:10.1124/jpet.106.103382. PMID 16675639. ^ Roth, BL; Driscol, J (Dec 2012). "PDSP Ki Database". Psychoactive Drug Screening Program (PDSP). University of North Carolina at Chapel Hill and the United States National Institute of Mental Health. Retrieved 7 July 2018. ^ "Wyeth Receives Approvable Letter From FDA For Pristiq (Desvenlafaxine Succinate) For The Treatment Of Major Depressive Disorder" (Press release). 2007-01-23. Retrieved 2007-04-04. ^ "FDA Approves Pristiq" (Press release). Wyeth. 2008-02-29. Retrieved 2008-02-29. ^ Health Canada Notice of Compliance - Pristiq. February 4, 2009, retrieved on March 9, 2009. ^ "Summary Basis of Decision (SBD) PrPristiq™". Health Canada. 2009-05-29. Retrieved 2016-12-30. ^ "Pristiq 100 mg Comprimidos de Liberacion Prolongada". AEMPS Medicines Online Information Center - CIMA. Retrieved 2016-12-30. ^ "Pristiq 50 mg Comprimidos de Liberacion Prolongada". AEMPS Medicines Online Information Center - CIMA. Retrieved 2016-12-30. This page was last edited on 24 March 2019, at 13:36 (UTC).